A convicted murderer who escaped during a prison visit to a hospital has been arrested after being on the run for more than a year.Shaun Walmsley, 29, was sprung from custody during a visit to Aintree University Hospital in Liverpool in February 2017. Merseyside Police said he was arrested in Leeds on Tuesday.He later appeared at Liverpool and Knowsley Magistrates' Court charged with escape from lawful custody.With shoulder length brown hair and a beard, he appeared by video-link and spoke only to confirm his name and date of birth. 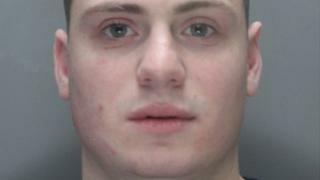 He was remanded in custody to appear at Liverpool Crown Court on 19 September. Walmsley was serving a life sentence with a minimum term of 30 years.He escaped when two men armed with a knife and a gun confronted guards outside the Liverpool hospital during a scheduled visit from HMP Walton.